Etsy Germany Street Team: Debrief: Marketing Meet-up with Matt in München! Matt joined about fifteen of us in Munich last week to share his thoughts on marketing. He riffed on topics as broad as creating a mission statement for your business and defining your brand to more tactical items like the importance of having a press page and using Google Analytics. Afterward the group lingered a bit to chat and exchange information. I've started a marketing tips discussion thread on our Etsy Team page where we can list both what we heard at the meet-up and any other ideas to share with each other. You can also see more pix of the event on our group Flickr pool here. 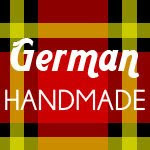 The next Hello Etsy sponsored meet-up in Munich will be on the evening of Thursday, August 11, 2011 at the Glockenbach Werkstatt. I will be giving a 'sneak peak' presentation of the workshop I'll be giving on project management at the Hello Etsy conference in September. Stay tuned for a Facebook Event. Thank you Eleanor :) Sounds good! Wish I could've attended! Will check out the thread :) Thanks, Eleanor!